Run along the rolling hills of Calumet County in rural eastern Wisconsin, the Cheesehead Half Marathon & 5K Run/Walk sees as many as 1,000 runners and walkers cross the finish line each year at its annual end-of-summer running, which is organized and hosted by the locally based Fox Cities Pacesetters running club. The out-and-back course for the race starts and finishes in downtown Hilbert, near the Village Hearthstone Restaurant on Main Street, and follows a course that’s best described as a loop through the countryside just north of town, much of which takes runners on long uphill stretches, according to runners who’ve finished the race in the past. From the starting line, runners in the half — it’s open to runners only, while the 5K is open to both runners and walkers — follow the route on a quick loop through town and then out onto Main Street, which becomes Hilbert Road. Runners then turn left onto Irish Road, which they follow north for the next few miles in the direction of nearby Forest Junction. The course then turns again onto Randolph and Harrison Street before turning onto the Fox River Trail, which runners follow all the way back until they meet up with Ott Road and head back onto Irish Road, which they follow into town for the finish back on Main Street. All finishers receive a “cheesehead” t-shirt and medal after they cross the finish line, provided they finish within four hours. Located in eastern Wisconsin, just a few miles west of Lake Winnebago and roughly 30 miles south of Green Bay, the town of Hilbert typically sees mild to moderately cool weather in August, which has brought record temperatures here as low as 38ºF (in 1968) and as high as 100ºF (in 1988). On race day (Aug. 17), the average low is 58ºF and the average high is 79ºF. See the race route map for the Cheesehead Run Half Marathon here. To reserve your spot in the 2019 running of Hilbert’s Cheesehead Half Marathon, 2-person Relay or 5K race, visit the event website below. 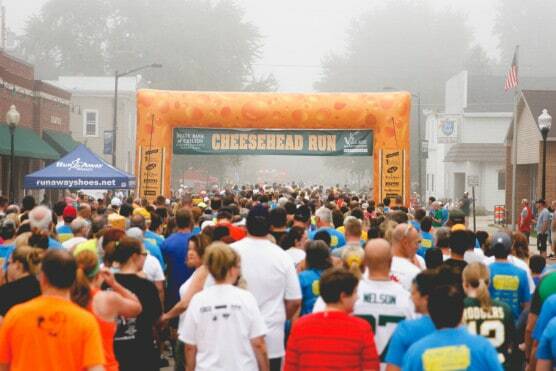 Ever run in the Cheesehead Run Half Marathon? Share your impressions here, or post your review in the Comments below. Is the cheese head race happening in 2019?